Thursday 21 May 2015. I set out today with 2 walks in mind. 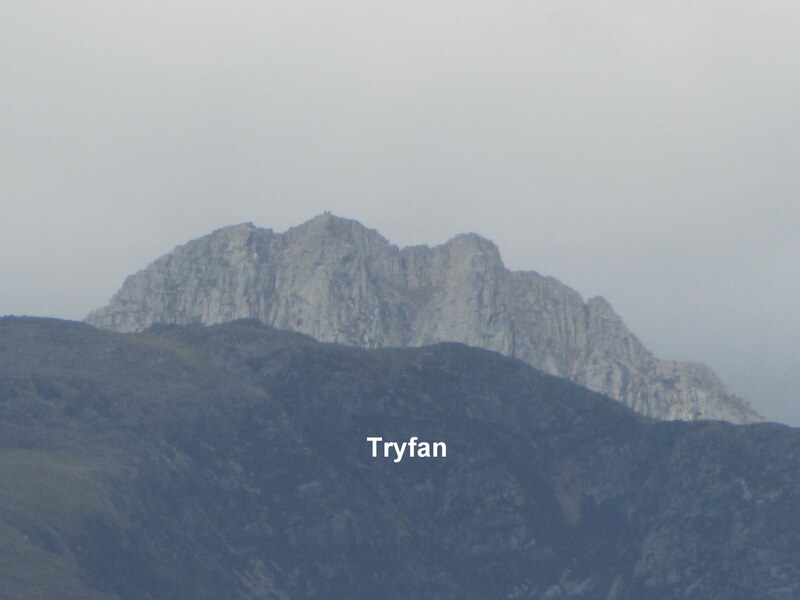 The first was Crimpiau from Capel Curig and the other was Y-Garn from Idwal Cottage. 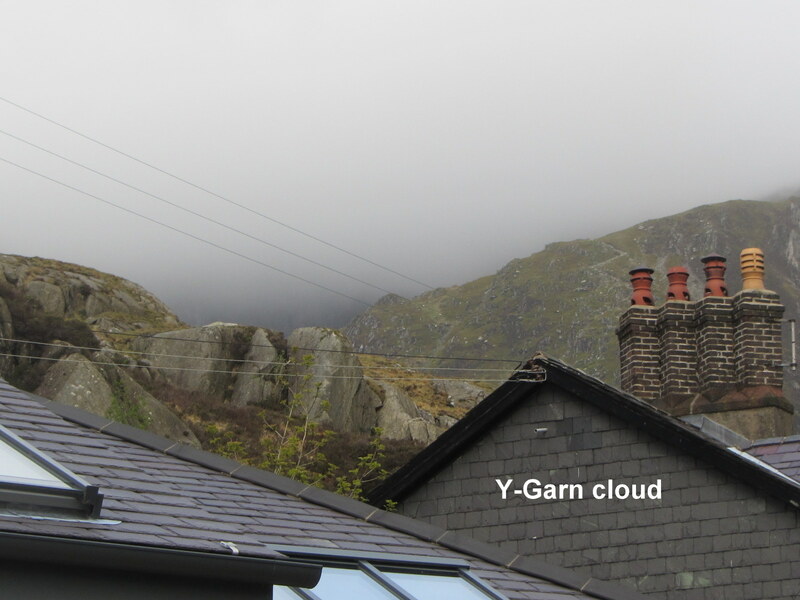 The sun was shining as I drove through Capel Curig but 4 miles away at Idwal Cottage the cloud base was down to less than 1,000ft. 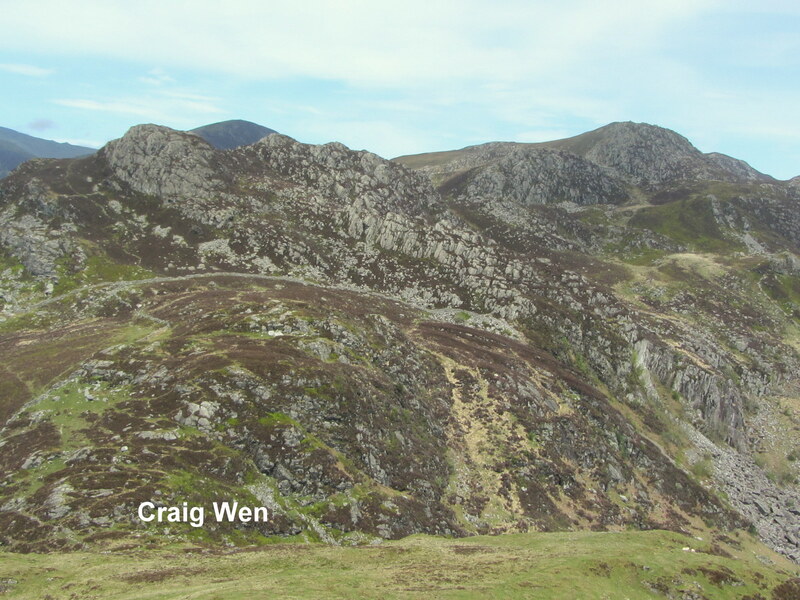 As Y-Garn is at 3,107ft, there was a strong possibility that I’d have a hard climb without any views. 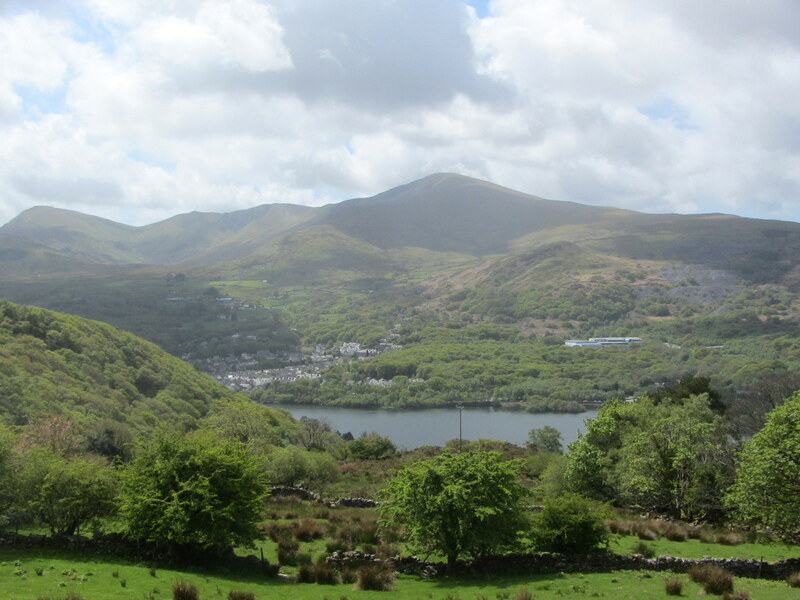 I decided to go back to Capel Curig and to do the easier Crimpiau walk with almost guaranteed views. This was only a short walk at 4.5 miles with 1,100ft of ascent. The outward leg was fairly easy until I turned west for the short sharp climb to the summit of Crimpiau at just over 1,500ft. 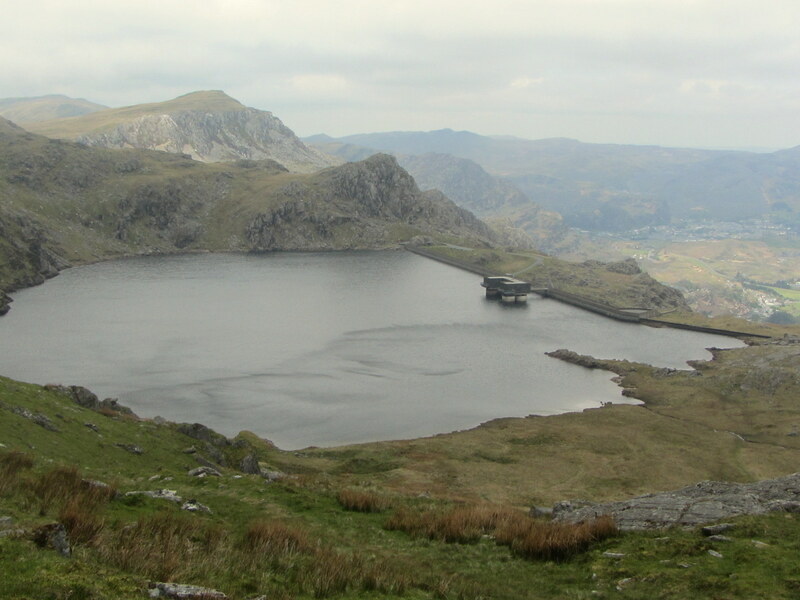 This provided great view across to Snowdon, still covered in cloud, and Tryfan. 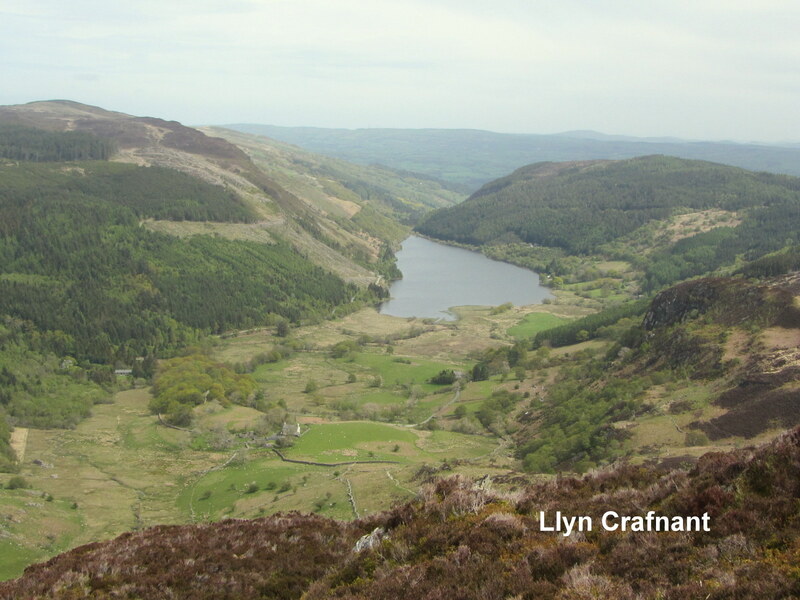 To the north was Llyn Crafnant from where Bea and I climbed Crimpiau on my last visit to Snowdonia. 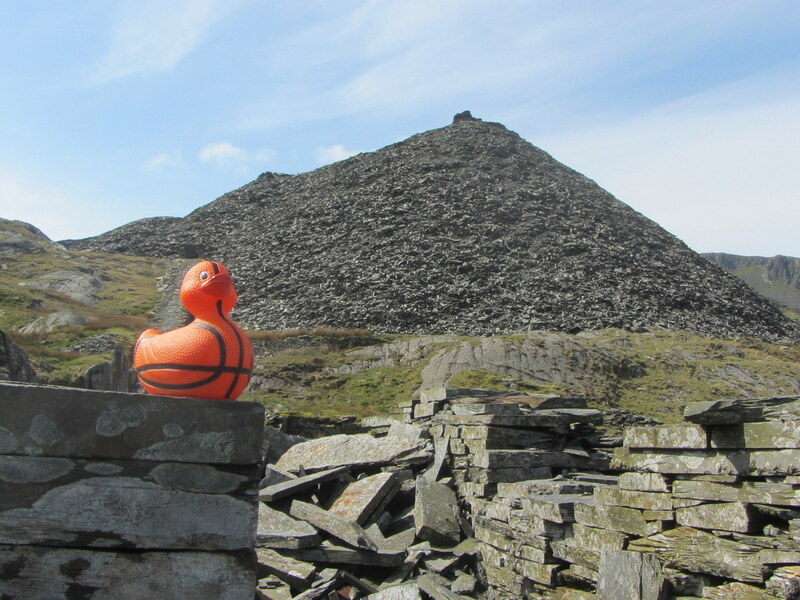 I had the summit to myself for quite some time until a group of 6 walkers came along to disturb my peace. 5 of them were heading north but the sixth, a guy for Holland (Richard) was going back to Capel Curig on the same route as me. 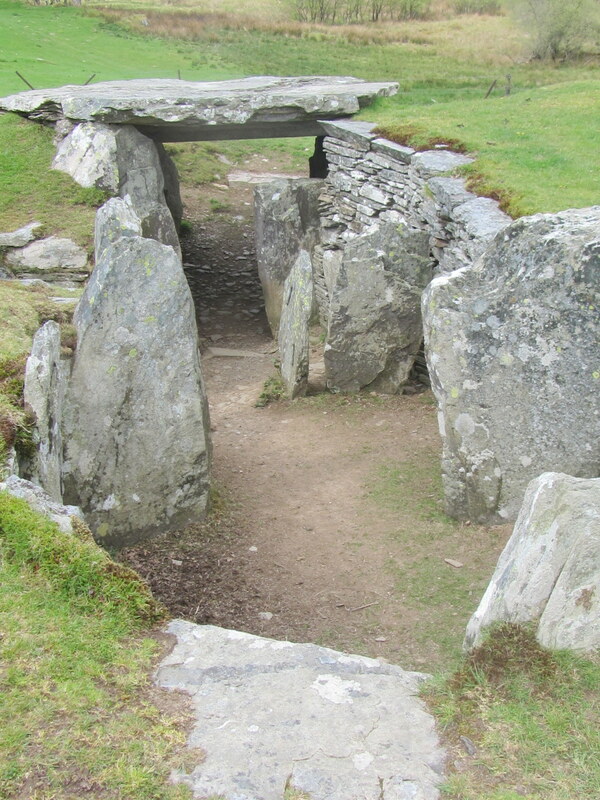 He only had a leaflet with an outline drawing of the route and a brief description of where to go. 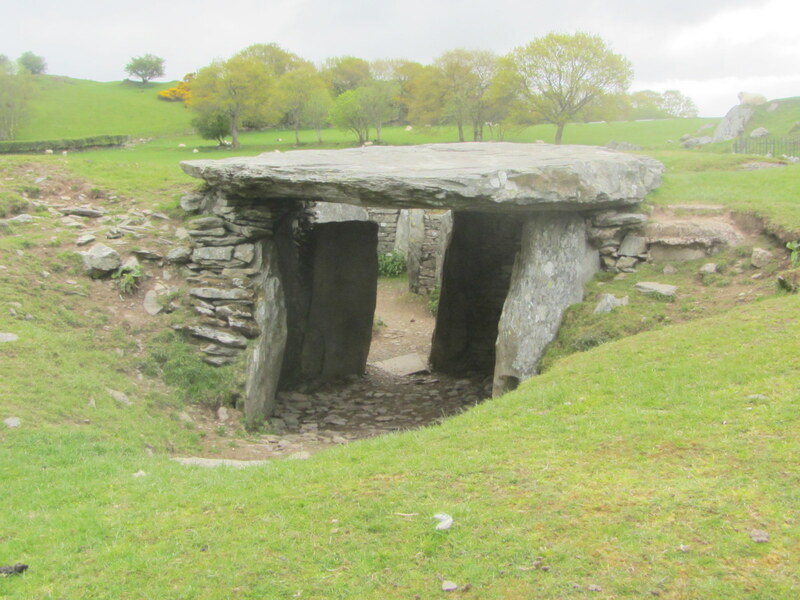 I suggested that we walked together back to Capel and it was perhaps a good job that I did as the return leg was less well defined and I had to refer to the GPS several times to find my way. 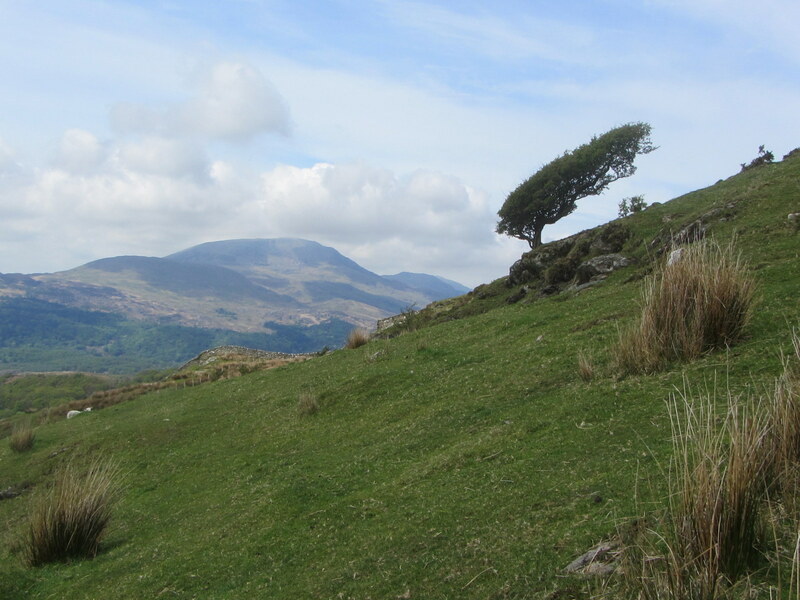 I think that I sprained my left ankle on Cadair Idris, the first walk of the holiday, and whilst it isn’t really too painful, it has restricted my choice of walks thereafter. The weather for tomorrow and Sunday isn’t forecast to be too good so I’ve decided that this will be my last walk of the holiday and I’ll come home on Saturday, a couple of days earlier than planned. This entry was posted in Uncategorized on 21/05/2015 by fenlandramblers. Wednesday 20 May 2015. 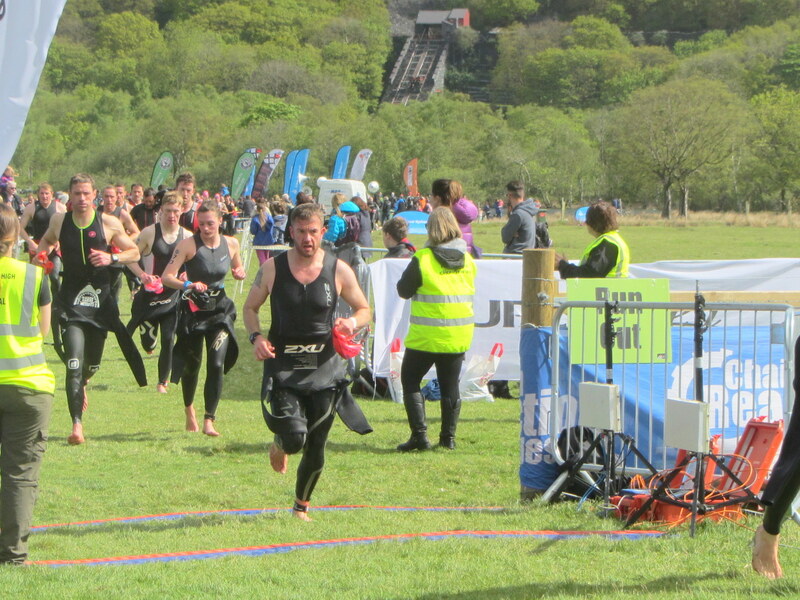 Last Saturday I walked the course of the Slateman Sprint triathlon run with some of the back-markers. 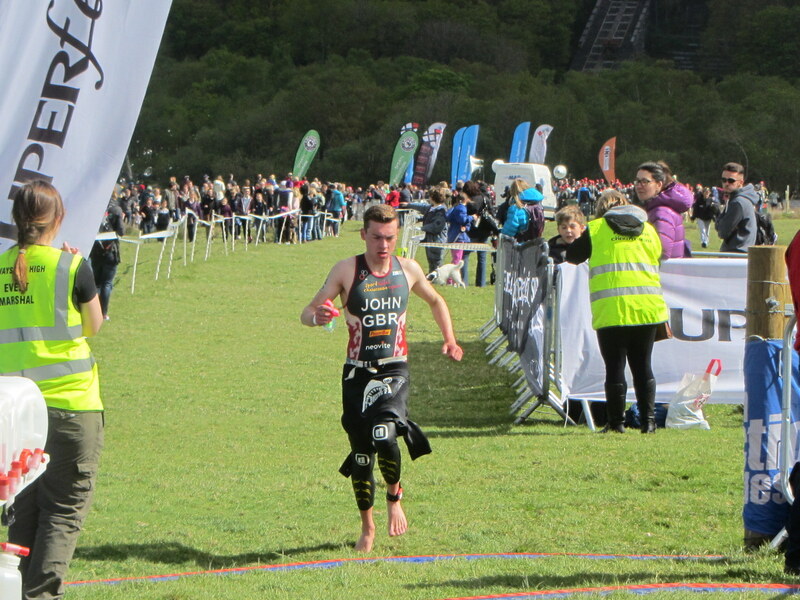 The following day, the full Slateman triathlon was held with the “run” leg being held on a slightly longer and different course. 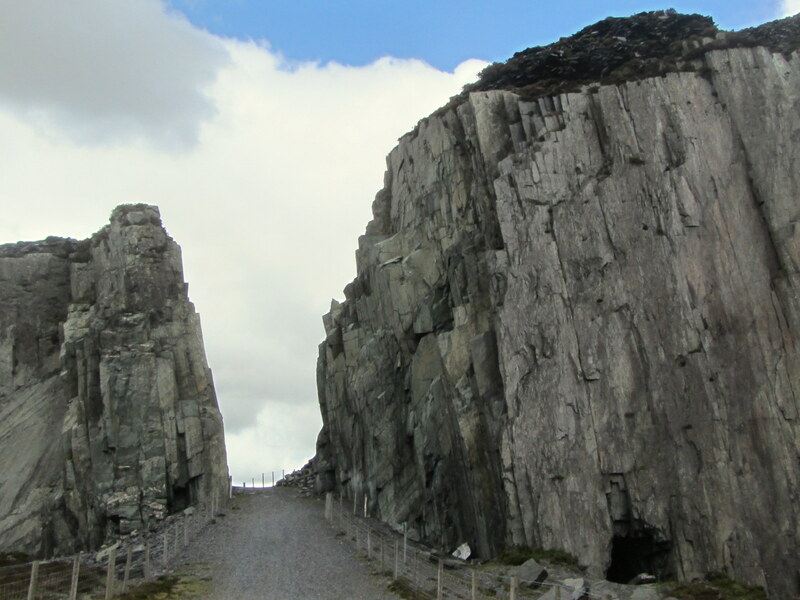 I thought that it would be good to walk this course as it coincided with some of the route that I wanted to do through the Dinorwig slate quarries. Leaving Padarn Country Park I followed a trail of orange arrows that had been spray painted on the ground to guide the Slateman runners. 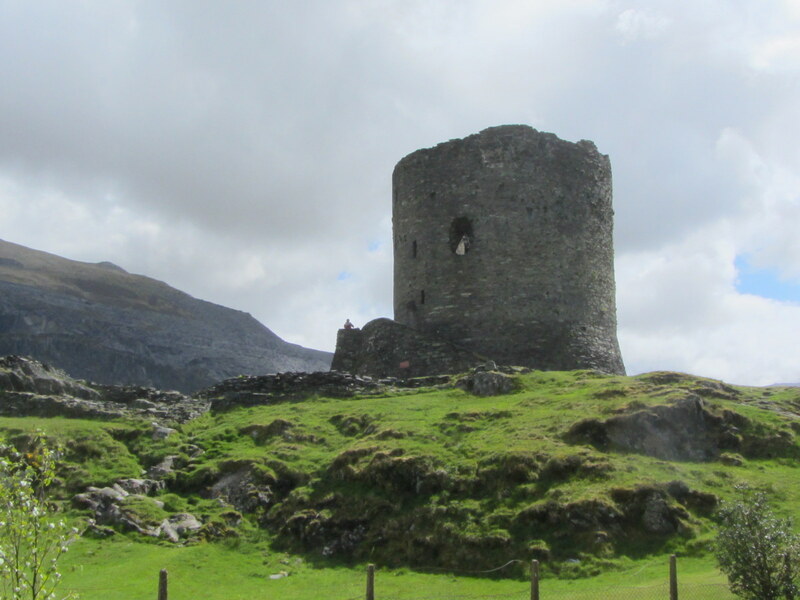 This soon took me past the ruins of Dolbadarn Castle and out on to the A4086 running alongside Llyn Peris. 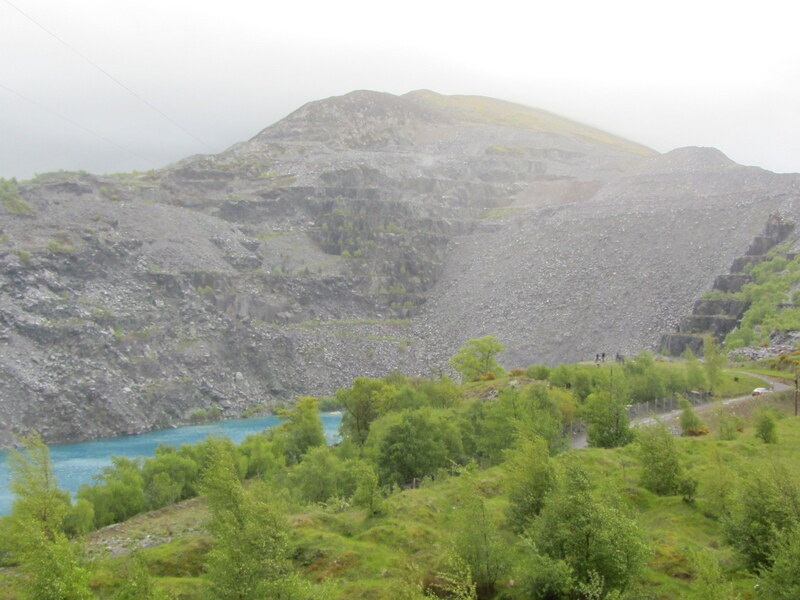 The main climb of the day started from the end of the lake as I followed a zig-zagging track up through the Dinorwig quarry. 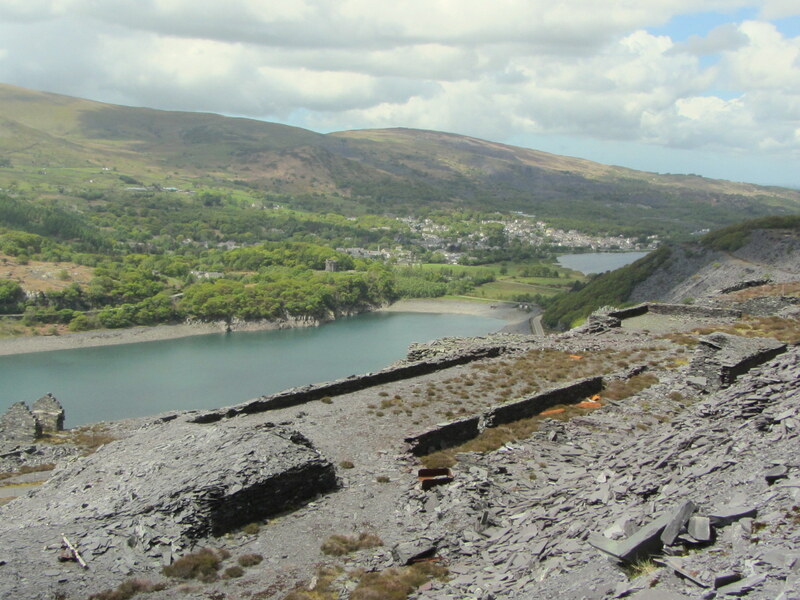 Public access is restricted to the lower half of the quarry but the viewpoint at about 900ft provides great pictures of the Llanberis pass, the town and Llyn Padarn. 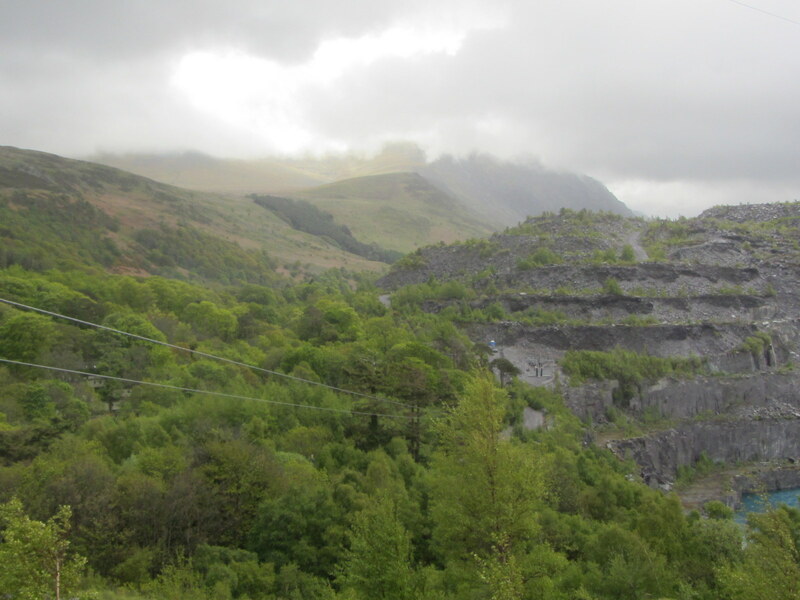 The quarries are at the foot of “electric mountain”, Elidir Fawr, which Karen and I climbed on my last visit to the area. 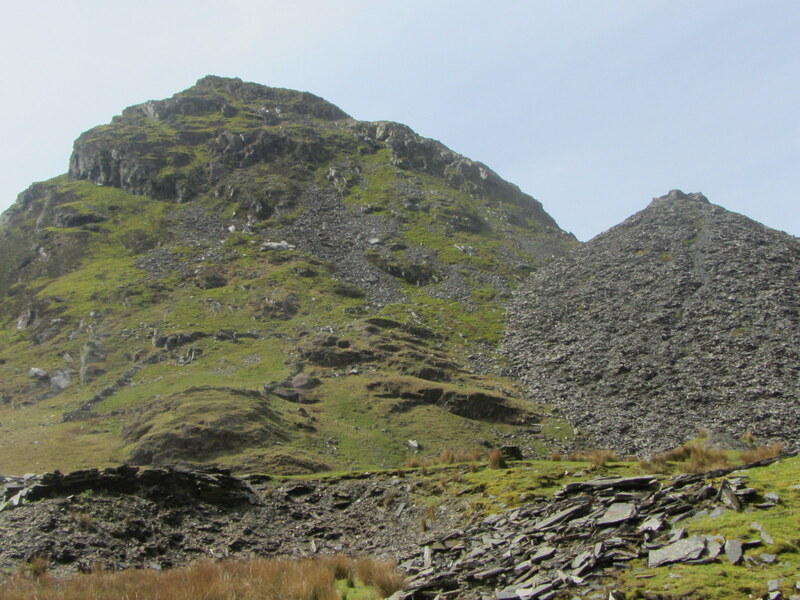 With most of the climbing behind me I followed the orange arrows through Coed Dinorwig but took a short cut to save about a mile of the route that I’d already walked last Saturday. 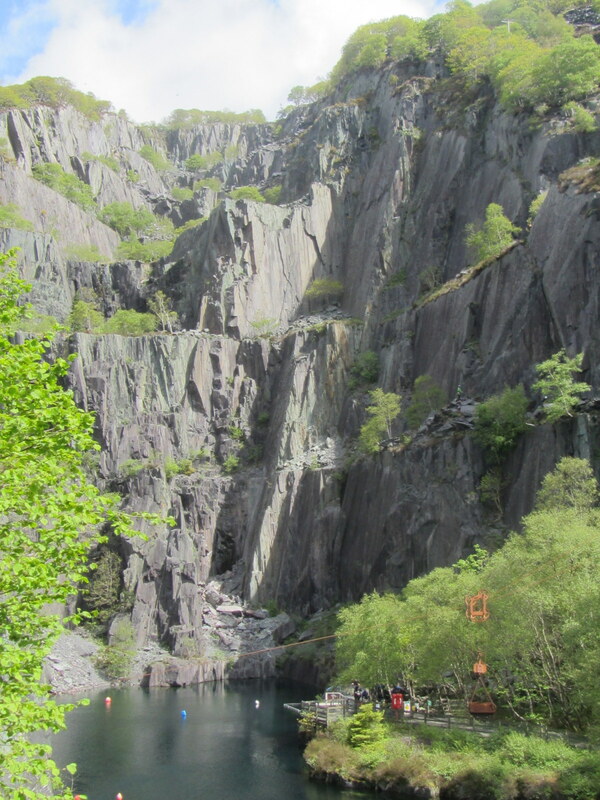 There was a strong chilly wind blowing as I climbed up through the quarries but by the time I got back to the car I was in a more sheltered area and it turned out to be quite warm. Although I cut a little bit off the full route of the Slateman run, my walk still turned out to be 6.8 miles with a surprising ascent of 1,980ft. This entry was posted in Uncategorized on 20/05/2015 by fenlandramblers. Tuesday 19 May 2015. 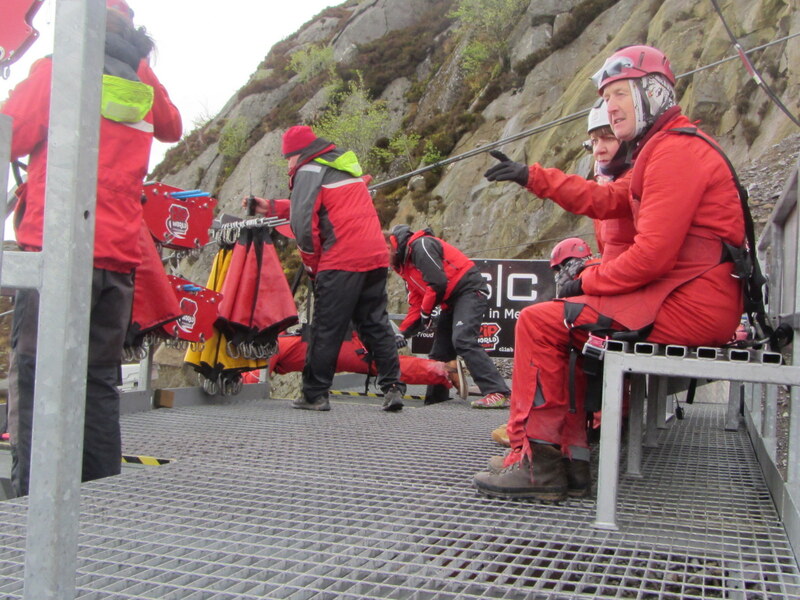 I decided to have a break from walking and to go for an adrenalin rush instead. 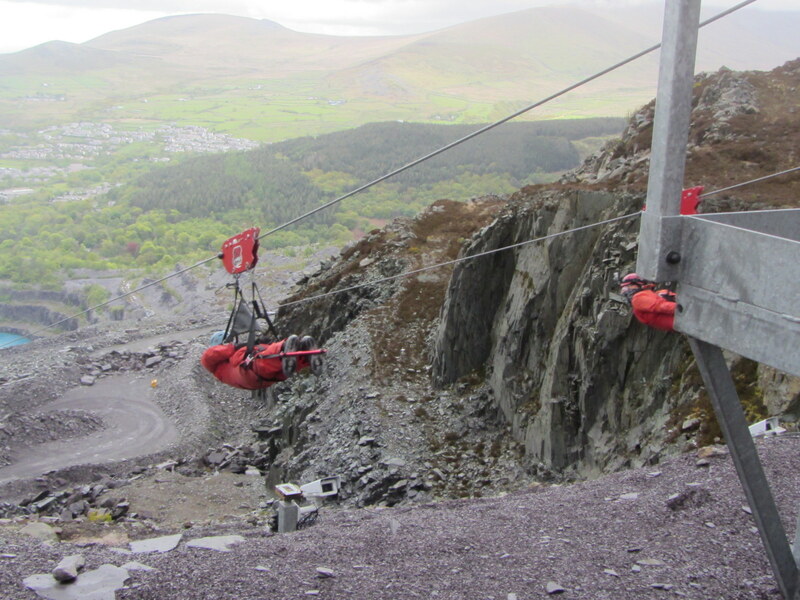 I’d booked myself for a couple of rides at Zip World in Penrhyn quarry, near Bethesda. 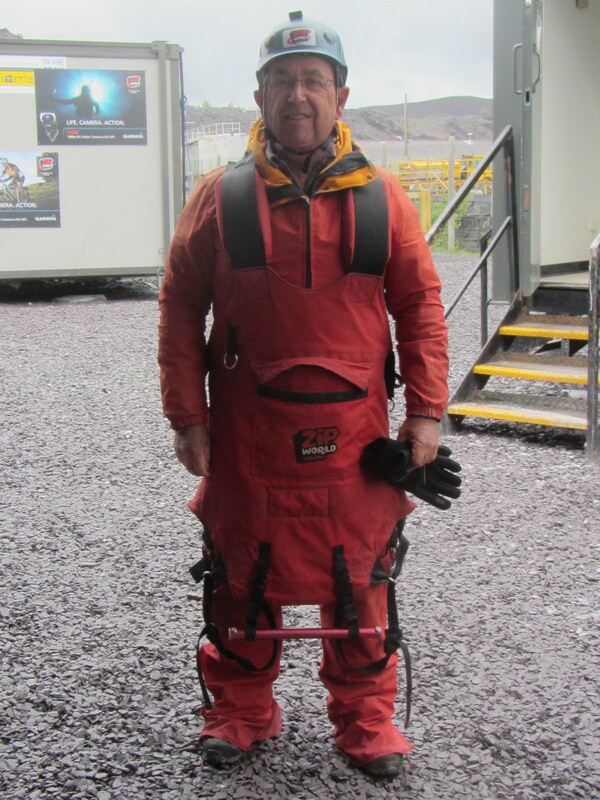 I think that I look stupid in the flying suit and harness that everyone has to wear and I guess that my fellow “flyers” thought that they looked equally daft. To get used to the idea of flying and to build confidence we started on the little zipper. This only reaches speeds of 45mph. 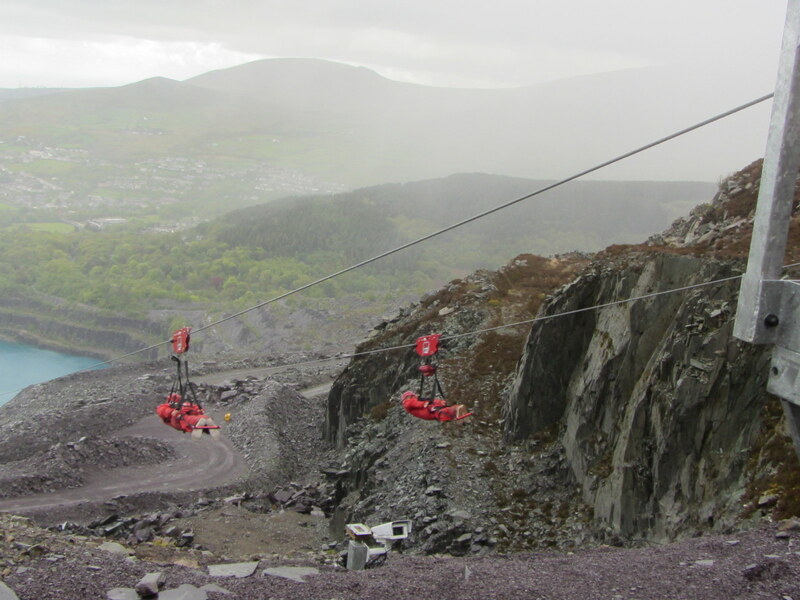 We were then driven on the back of a lorry to the top of the quarry for the ride on the big zipper which reaches speeds of up to 100mph. 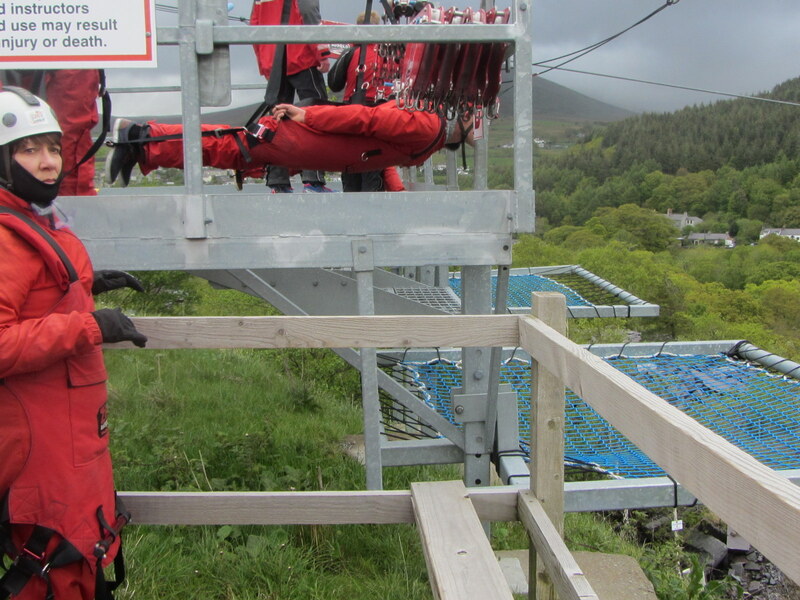 The first ride was exciting especially as you hang there in a harness ready to be launched down the cable. There is a system of arrest cables to slow you down at the end of the ride and they ask you to open your arms out wide to provide additional air resistance braking. 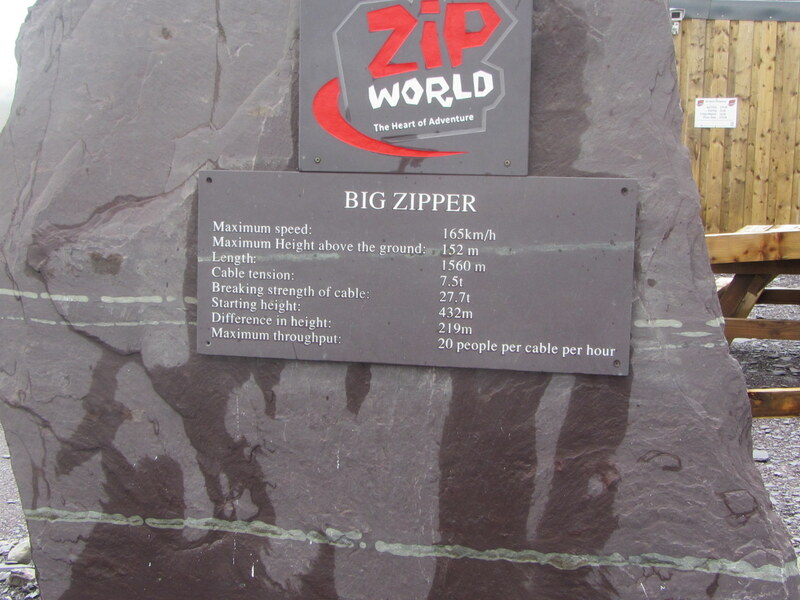 The big zipper has a drop of over 700ft and passes over the lake at the bottom of the quarry. 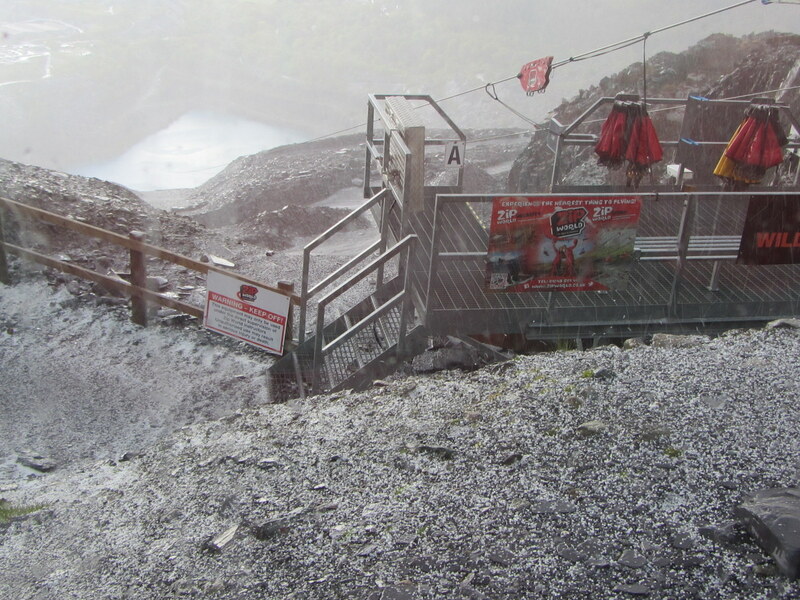 My flight was delayed for 5 minutes or so whilst a hail storm blew through. The big zipper lasted for all of 55 seconds and at one point there was an odd sensation as if I was coming to a standstill over the lake. I thought that I was flying more slowly than the guy on the other wire who was launched at the same time as me but it must have been an illusion as the following official video shows us arriving at the bottom at more or less the same time. I’m on the left hand wire in most of the video. I took the next 3 video clips in an attempt to capture the thrill of the ride. This entry was posted in Uncategorized on 19/05/2015 by fenlandramblers. Monday 18 May 2015. It has rained for the last 15 hours and finally stopped at about noon today but I’ve decided to spend some time catching up with TV and browsing the internet. 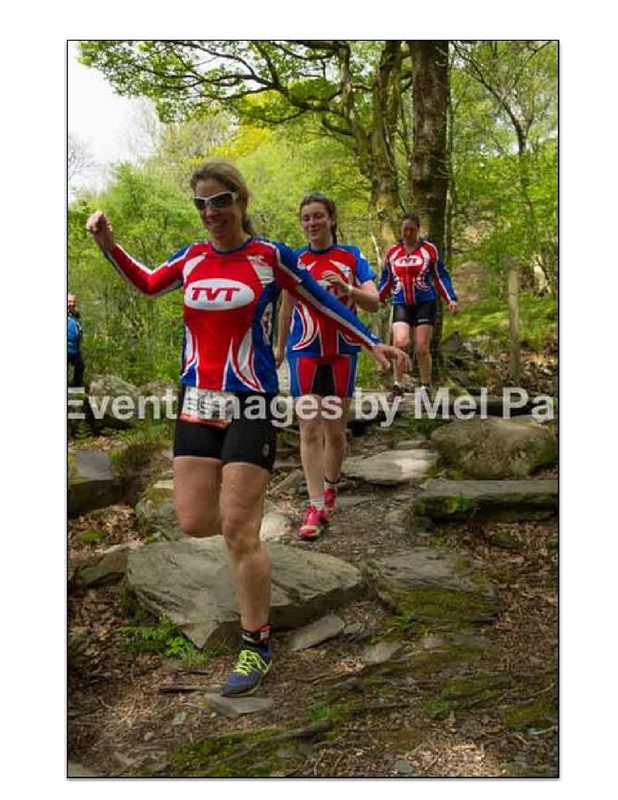 I’ve just checked the results for the Slateman Sprint triathlon and see that these 3 ladies from Thames Valley Triathletes came last. I stood to one side so as to avoid spoiling the photographers picture but if you look carefully you’ll see a little part of me on the left hand side. 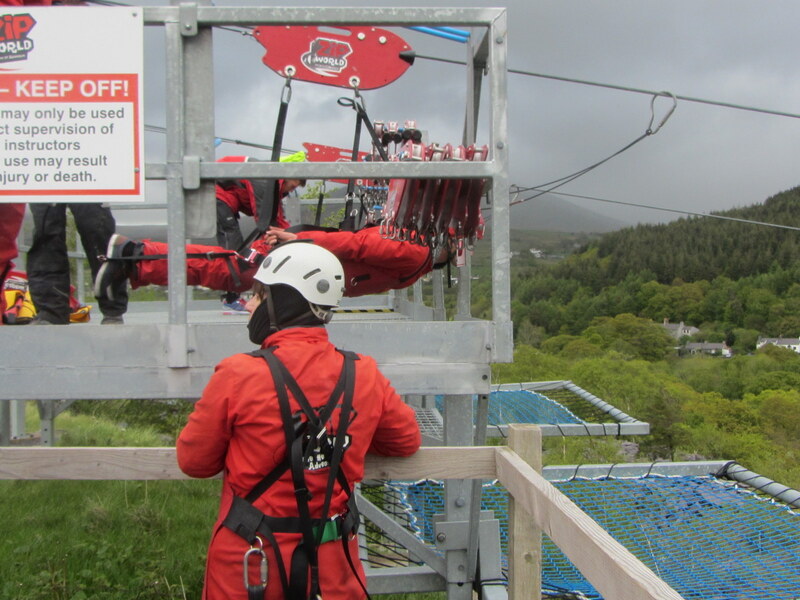 The weather forecast for tomorrow is even worse but I’ll be getting out there for a pre-booked zip wire ride. More of this later. This entry was posted in Uncategorized on 18/05/2015 by fenlandramblers. Sunday 17 May 2015. 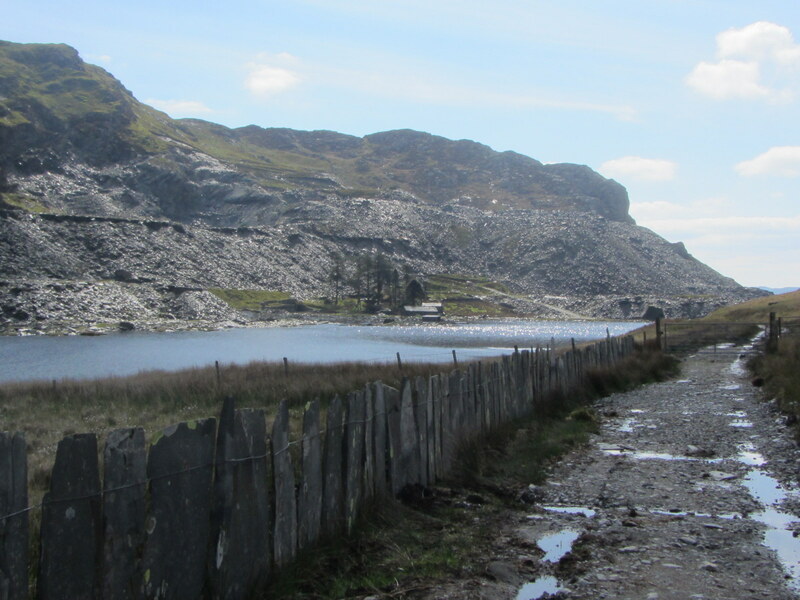 With 2 football matches on TV this afternoon, I wanted to do a slightly shorter and more local walk today so I opted for a 6.5 mile route with 1,370ft of ascent starting from Betws-y-Coed. 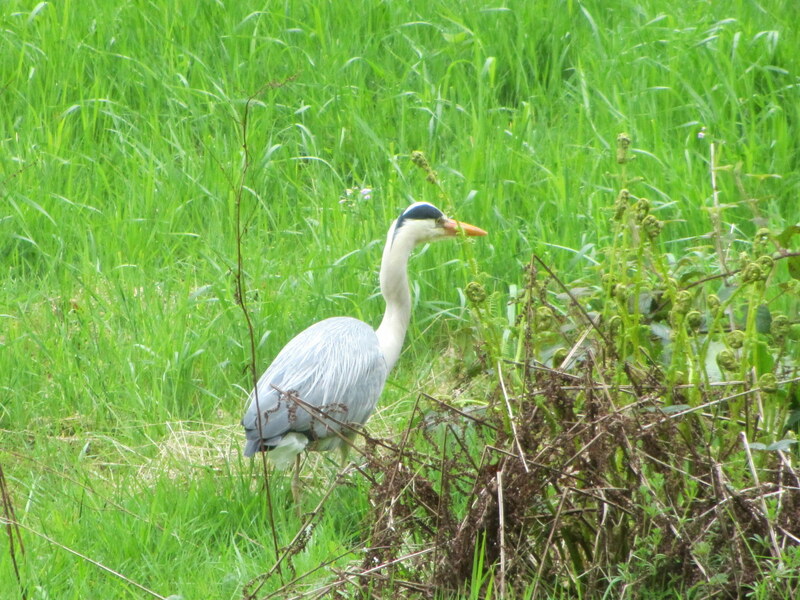 I made a start at just after 9am and set off along a small road heading up the Afon Conway valley where I caught a picture of a motionless Heron looking for its breakfast. Crossing over the river I then followed a bridleway close to the Fairy Glen and after an hours walking I arrived at the Conway Falls cafe. I hadn’t brought anything to eat or drink with me today so it was a good excuse to stop for a coffee and a bacon sandwich. 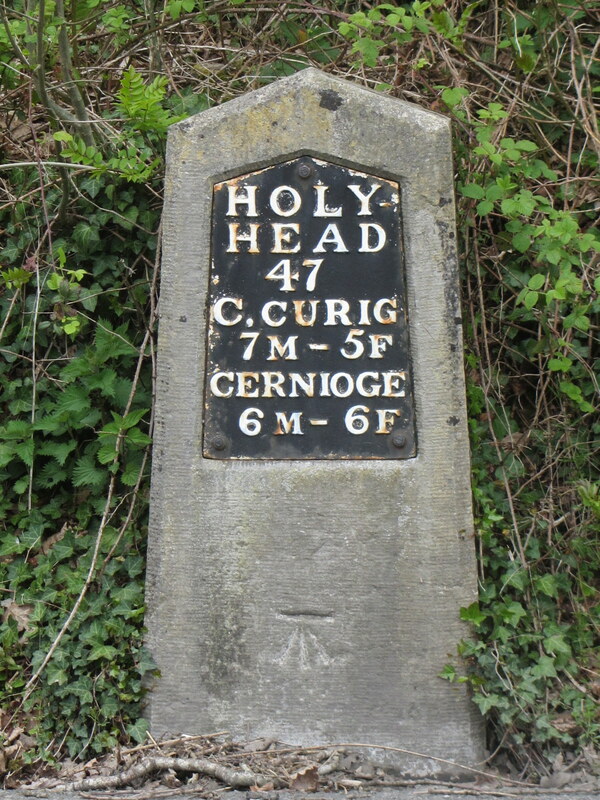 Opposite the cafe was a milestone with distances still shown in miles and furlongs. i can’t recall seeing anything similar before. 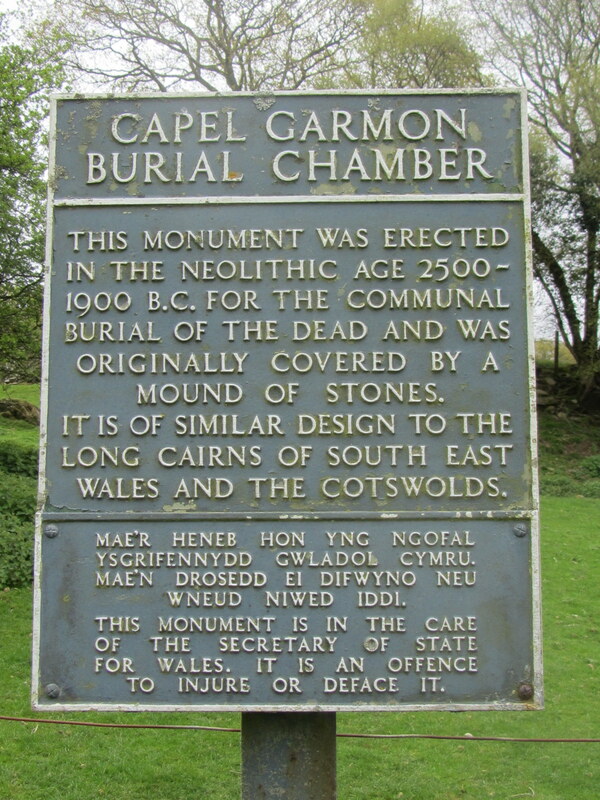 The next leg of the walk continued uphill to visit the site of the neolithic burial chamber at Capel Garmon. At this point I was almost 800ft higher than my starting point and had good views of the surrounding hills/mountains. 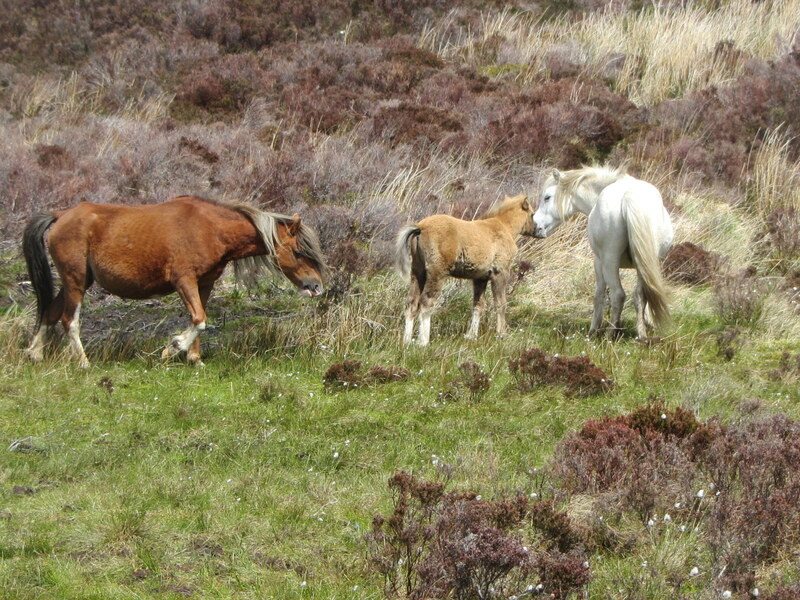 With the hard work behind me it was more or less all downhill back to Betws-y-Coed. My new Samsung Tab4 tablets continues to perform poorly in terms of retaining an accurate GPS fix. It acquires the GPS satellites and gives an accurate location reading but this soon drifts off-course and can only be corrected by stopping and starting the GPS function which spoils the tracklog record. I’m really disappointed with this tablet as my old Tab2 performed with amazing accuracy before the tablet itself started malfunctioning last week. I can only apologise to Jacqui who also bought a Tab4 on my recommendation and hope that her device performs better than mine although I can’t think of any reason why this might happen. As Karen will testify, navigation is made a whole lot easier when supported by a tablet running digital mapping and providing an accurate GPS location. I can manage without my tablet but for the remainder of this holiday as I’ll be using my phone as my primary navigational aid. I’ll run the new Tab4 at the same tine to see if it will perform any better. I’ve ordered a couple of 32gb micro SD cards and when I get home I’ll install one of these in the old Tab2 tablet and see whether or not it repeats the malfunctions of last week. I need a reliable primary or backup device so I’ll make a visit to John Lewis in Peterborough to have a look at the Asus MeMO Pad 7 tablet. It has good reviews so I’ll probably end up buying one and will give my new Samsung Tab4 to my great-nephew who is 14. He should appreciate this gesture, especially as I bought his 9 year old sister a Tesco Hudl for Christmas. 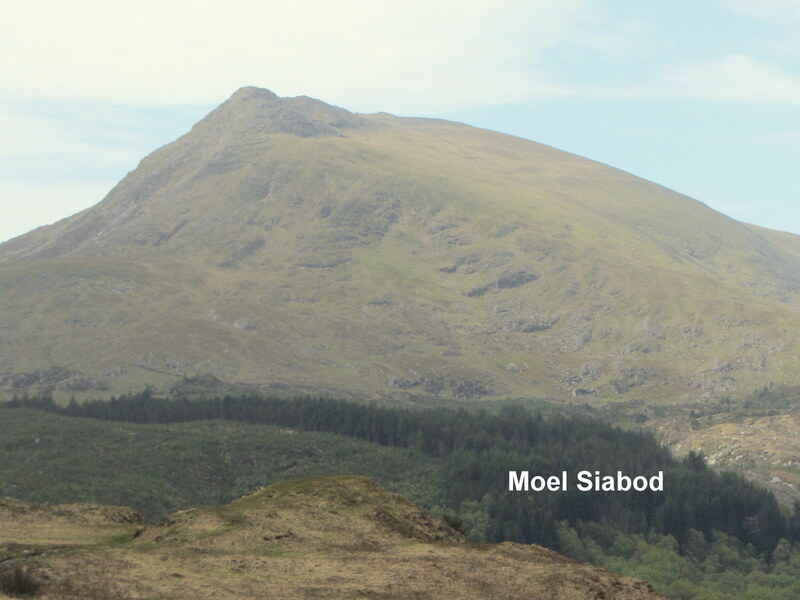 Moel Siabod to the left and the Glyders just right of centre which I’ve climbed before. 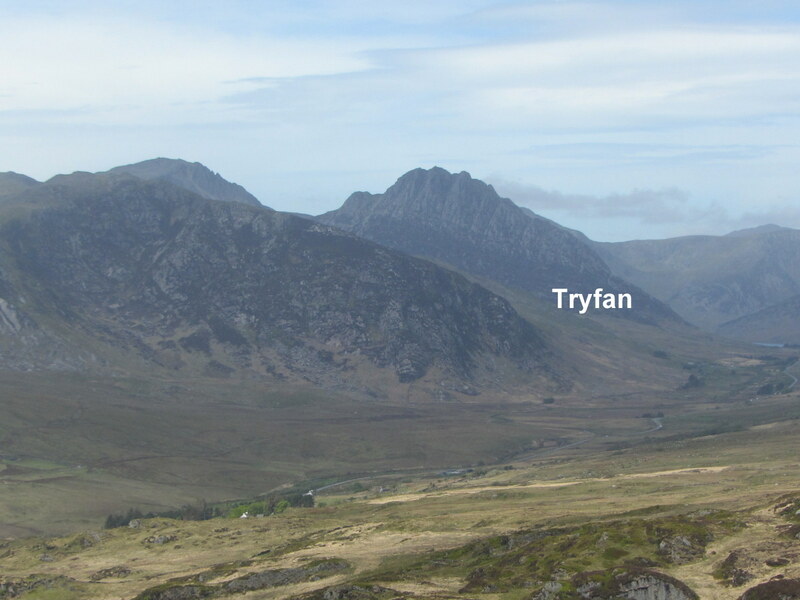 Tryfan to the right which I’d like to climb but has a fearful reputation of walkers becoming cragfast. This entry was posted in Uncategorized on 17/05/2015 by fenlandramblers. Saturday 16 May 2015. 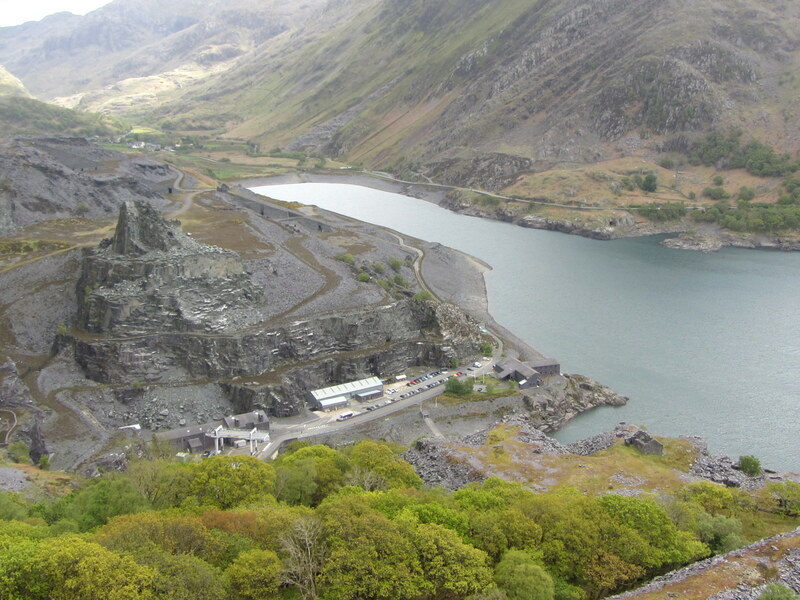 I set off today for a walk around the Dinorwig slate quarries which are on the opposite side of the valley to Llanberis. 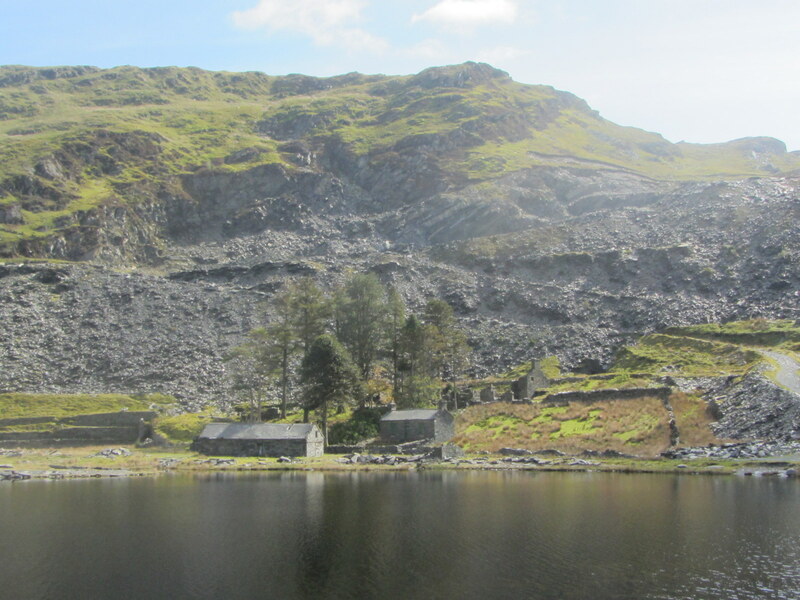 As I turned to drive down the Llanberis pass there were notices advising that the road would be closed for 2 hours from 10:15. This was the route for my drive back. 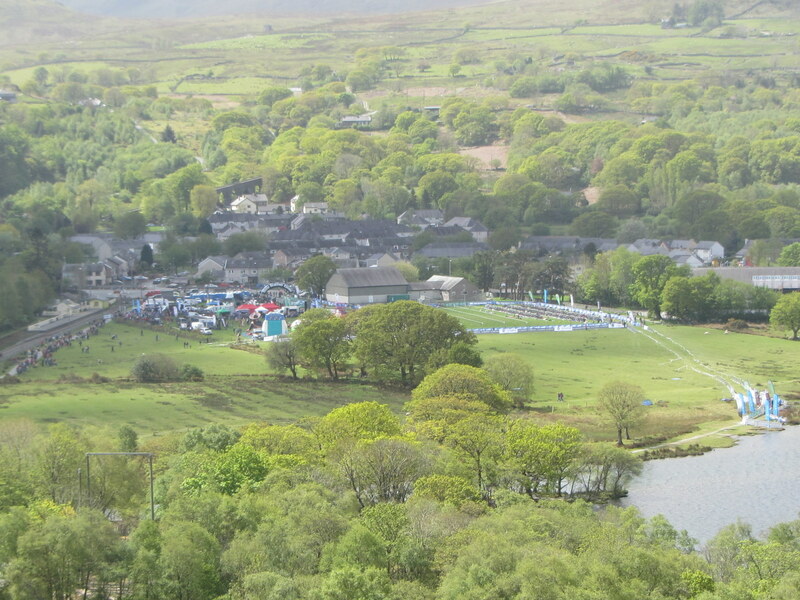 When I arrived in Llanberis it was clear to see that the road would be closed for the Slateman triathlon which would include a bike ride up the pass to Pen-y-pass and back again. 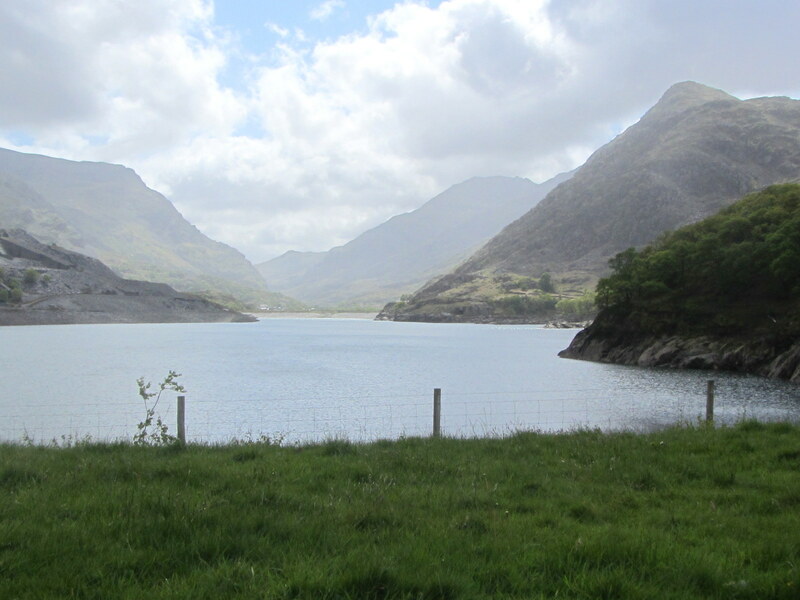 Either side of the bike ride was a swim in the lake which was only 11c and a run up and down through the woods to just below the village of Dinorwig. I felt like I needed an easy day so I decided to watch bits and pieces of the triathlon and to go for a shorter walk. 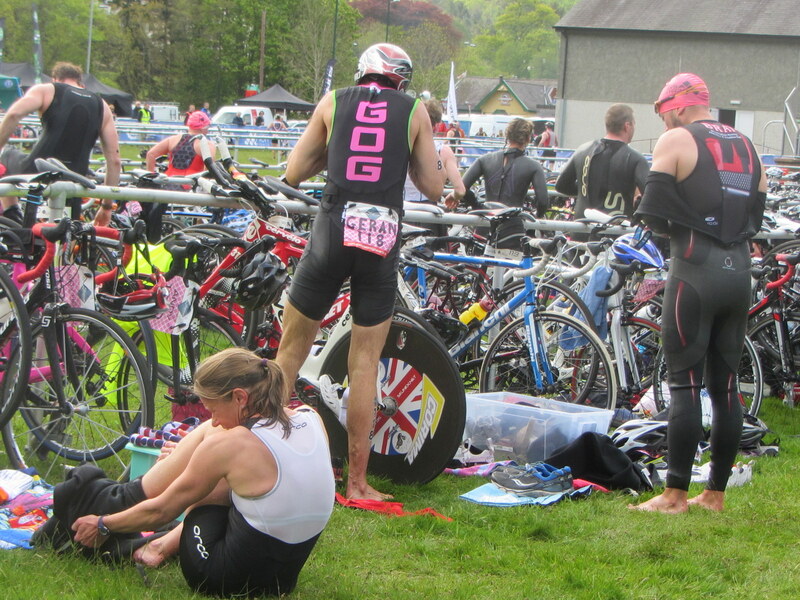 I waited at the transition area to watch the pacemakers get out of their wetsuits and on to their bikes. After a coffee I came back to see the bikers come back down from Pen-y-pass and to set off for their run. Enough of the watching, it was time to set off for my walk. 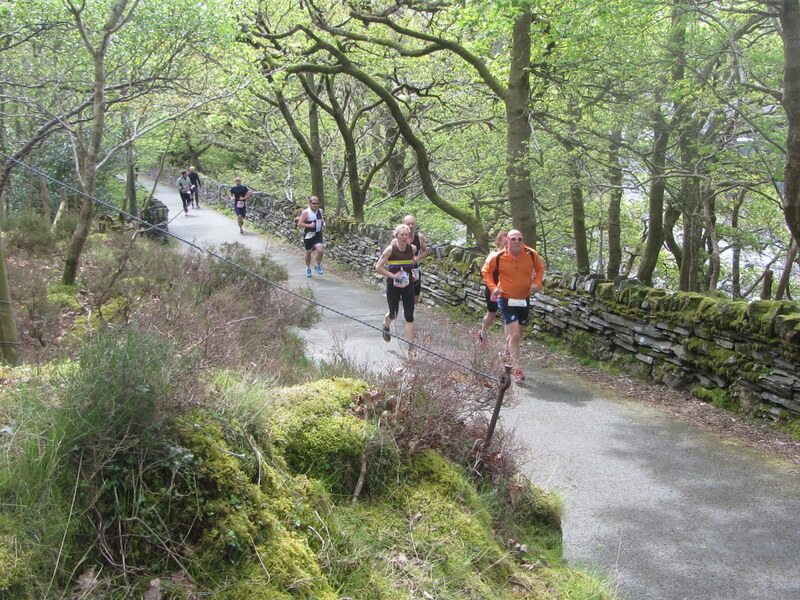 My route from the Padarn Country Park coincided with that of the runners for a little while before I diverted off up a series of steep steps. It wasn’t long before our paths merged once more and I found myself amongst the backmarkers as they toiled uphill; walking more than running. 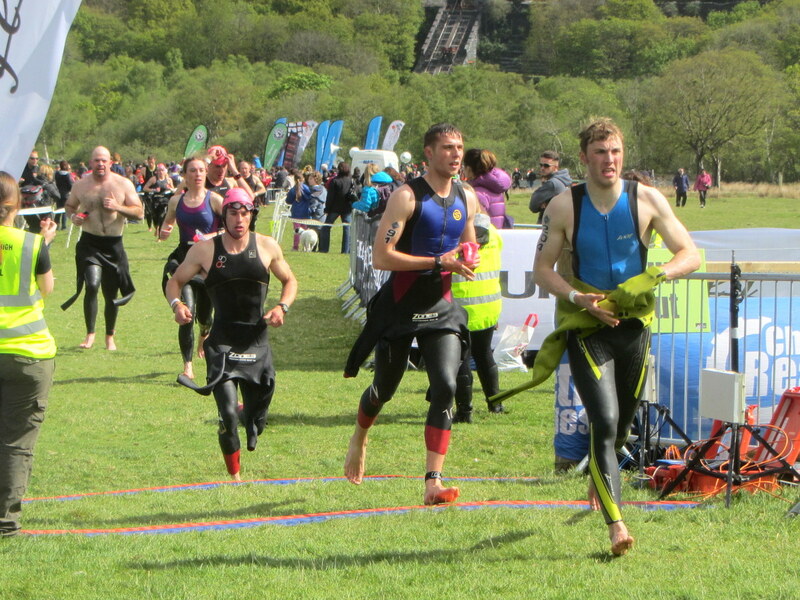 It was a savage course of only 6km but followed a 400m open water swim and a 20k bike ride. 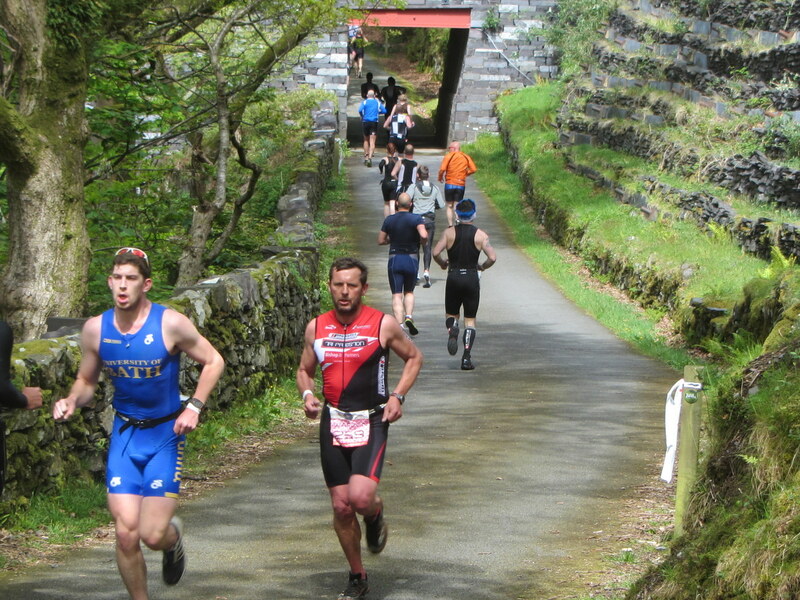 This was the easy course which attracted 600 competitors with the full triathlon being held tomorrow. I stopped for lunch at the top of the runners course and had a chat with the marshals as the last of the runners came through. 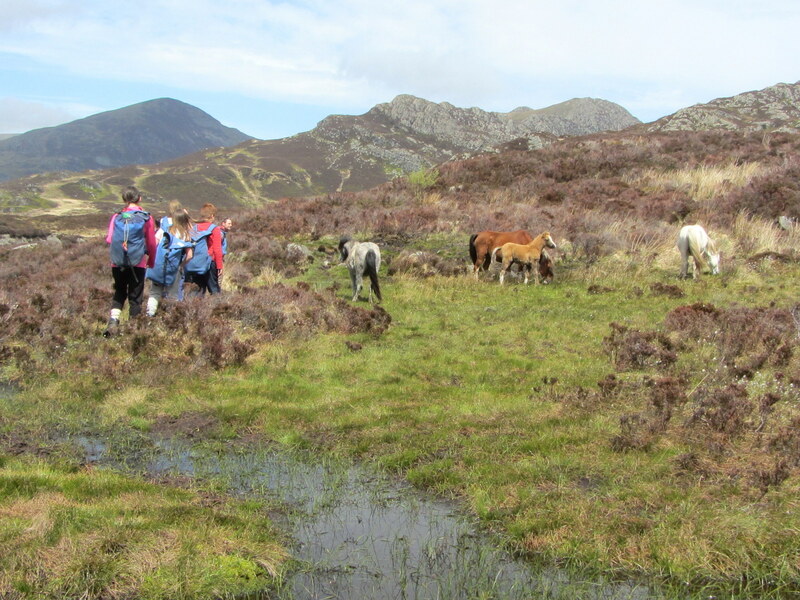 As I made my way back to Llanberis I was overtaken, but very slowly by one or two straglers who were finding it all a bit too much. Credit to them, however, for taking part. It turned out to be a fine sunny day and my 5 mile walk with 1,200ft of ascent made an interesting diversion from serious walking. This entry was posted in Uncategorized on 16/05/2015 by fenlandramblers. Friday 15 May 2015. It rained for much of yesterday so it was a relief to get out walking again today. When searching for this walk I had two things in mind. The first was to revisit Cnicht which Bea and I climbed on a previous holiday in the area. Whilst this would have been possible it would have made for an even longer and harder walk than the one that I did today. 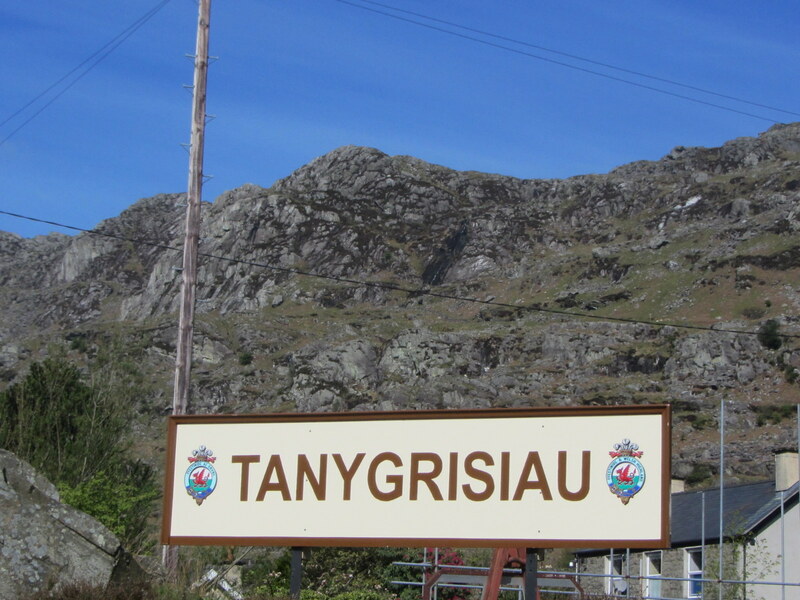 The second reason was that I passed through Tanygrisiau when riding on the Ffestiniog railway and thought that the surrounding mountains were magnificent and would like to explore them on foot. 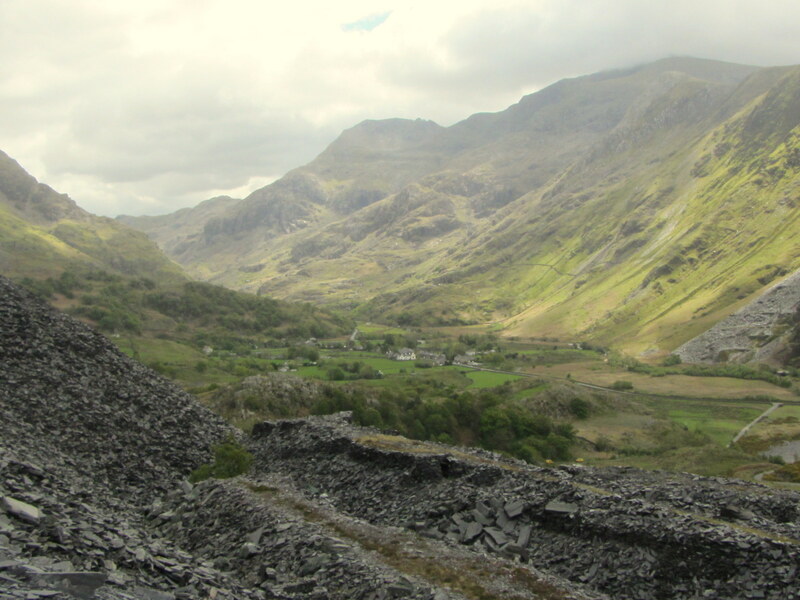 The drive to the start of the walk was uneventful until the satnav decided to take me on the back road through Tanygrisiau. This was just wide enough for my car, up 1in3 hills and over blind brows. I’m glad that I didn’t meet anything coming the other way but the locals probably have more sense and use the more acceptable lower level road that I took on my way home. 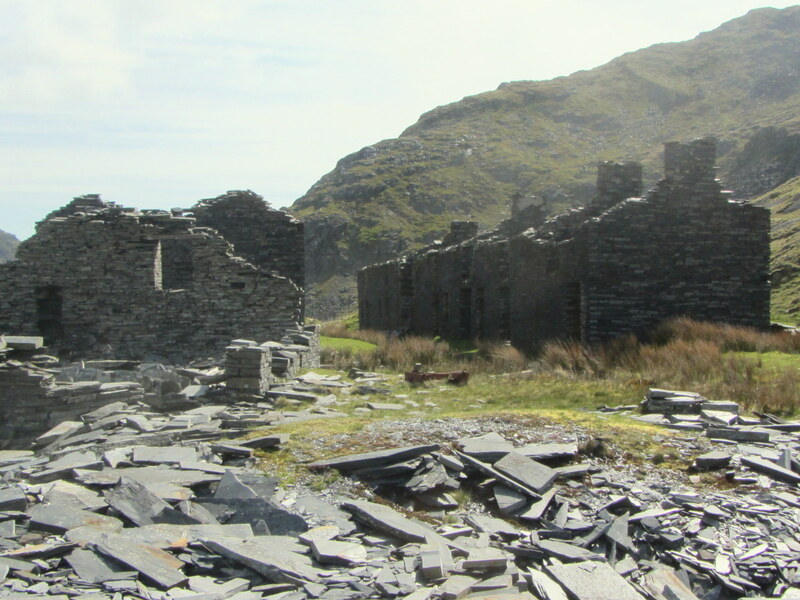 Leaving the village I had a steepish climb up to Llyn Cwmorthin where it leveled out for a while before climbing steeply again to the disused slate mines of Rhosydd quarry. 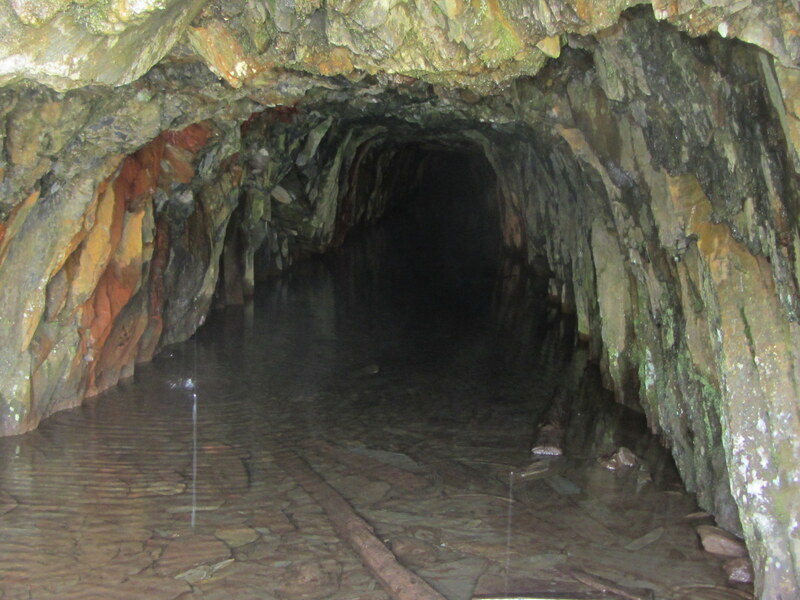 I stopped for coffee here and had a look in one of the flooded mine tunnels. 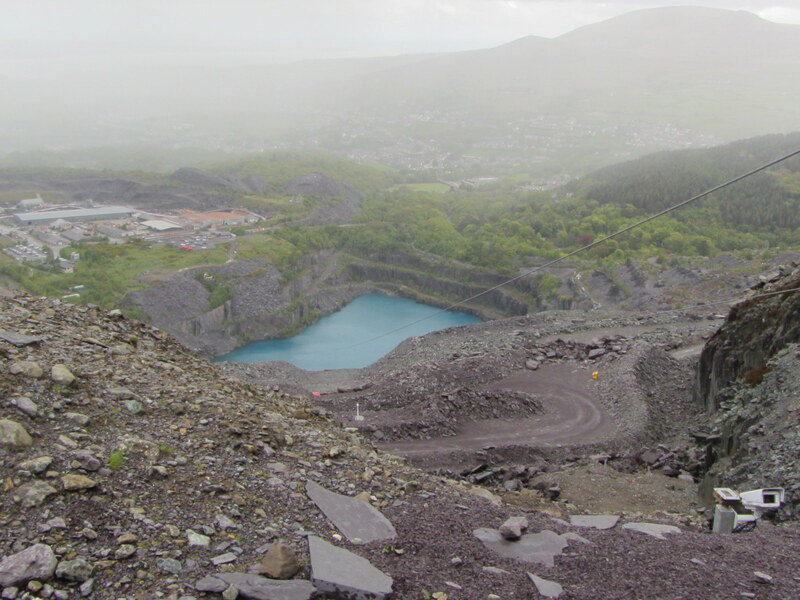 From here the paths disappeared and it was a case of referring to the GPS to find my way across open countryside to Croesor quarry where I had lunch. The absence of a discernible path continued for almost all of the remainder of this walk as I descended to the minor road near Penrallt. 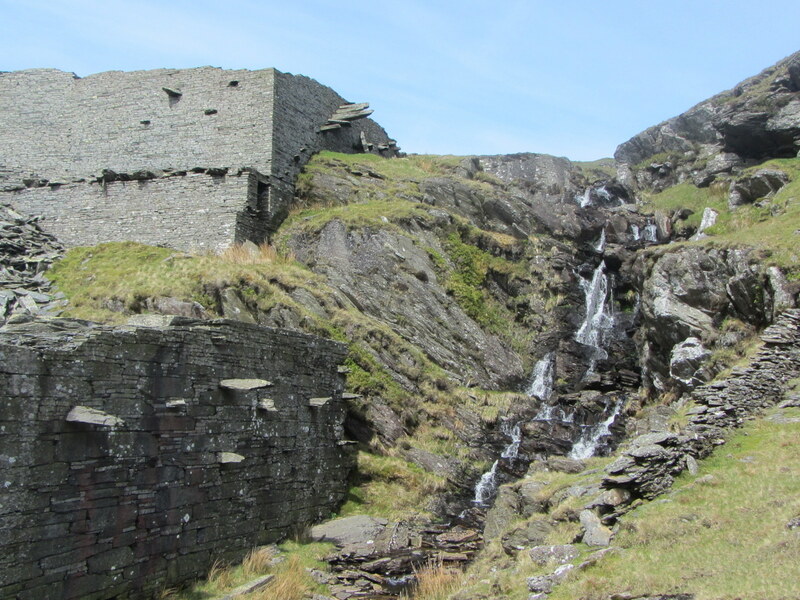 The next 2 miles were an unremitting slog with an ascent of 1,300ft to Bwlch Stwlan. 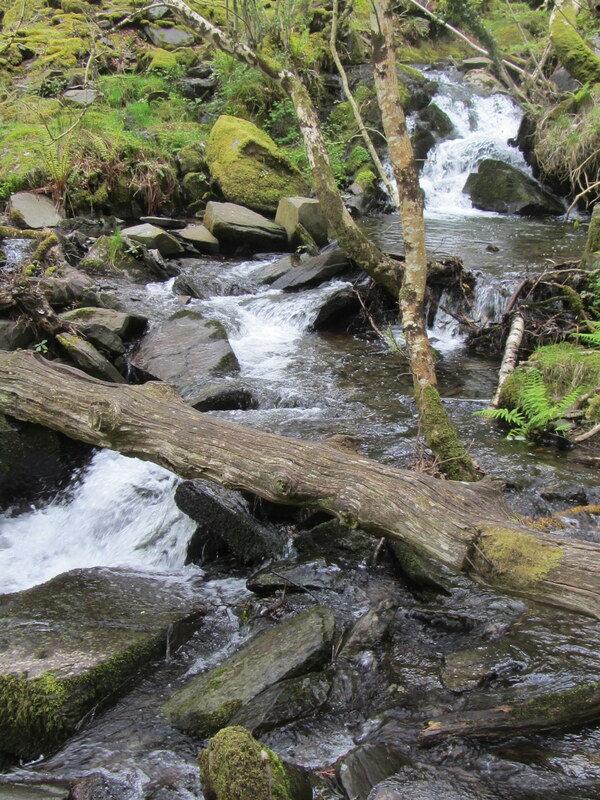 The short road walk was all uphill followed by an assault course of fallen trees in the next forestry section. The last part of this climb was across open fellside with boggy areas making it tough going. With the climbing behind me it was all downhill from here and steeply at that. Passing Llyn Stwlan I followed the line of Afon Stwlan back to Tanygrisiau. The walk was 9.4 miles with a total of 2,985ft of ascent and took me six and three-quarter hours to complete. I really must find something a little easier for tomorrow. 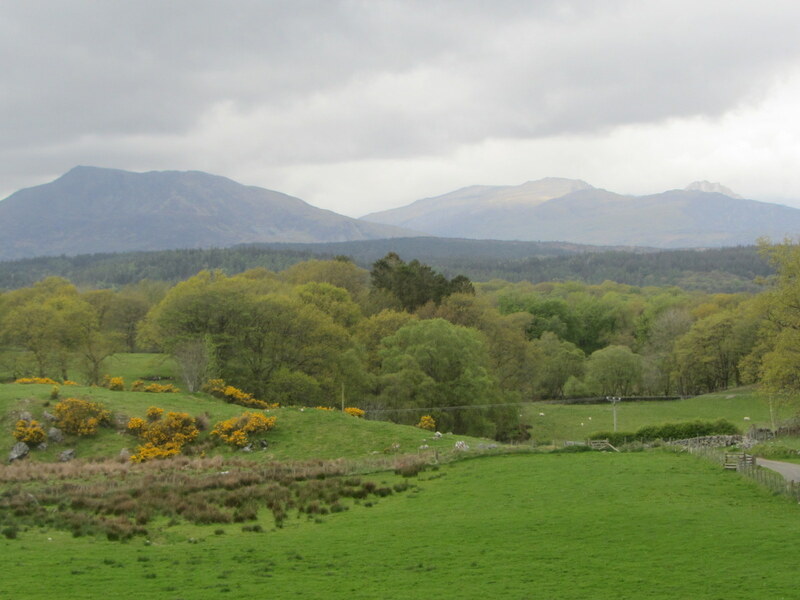 The following video shows a view of the hills and mountains between Porthmadog and Cnicht with cloud capped Snowdon in the distance. This entry was posted in Uncategorized on 15/05/2015 by fenlandramblers.